A gift to make a seat available for another. 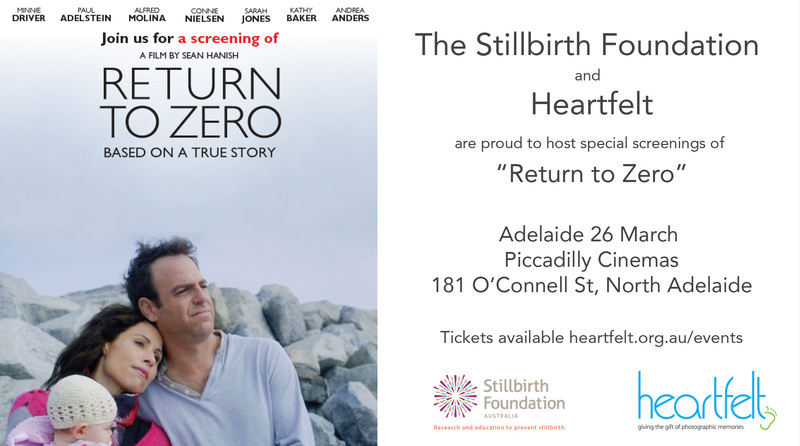 Heartfelt and the Stillbirth Foundation are proud to present the first Australian cinema screenings of the movie "Return to Zero". This is our rescheduled screening of the unsuccessful screening of 13 March, tickets purchased for the 13 March event are valid for this screening. Maggie and Aaron attempt to go on with their lives but cannot escape their postpartum grief. Their lives and relationship have been forever altered by this loss. And no one seems to understand the hell they are going through. Aaron’s dad, Robert (ALFRED MOLINA), encourages his son to bury himself in work, while Maggie’s Mom, Kathleen (KATHY BAKER), always says the wrong thing. Maggie and Aaron try to cope in a myriad of ways undefined through denial, escape, and alcohol undefined but when Maggie ultimately discovers that Aaron is having an affair with Dana (SARAH JONES), a co-worker, she decides to end the marriage. Just when Maggie believes she has started a new life, she discovers that she is pregnant by Aaron (from a last ditch ‘save the marriage’ getaway to Vegas.) With the help of Claire (CONNIE NIELSEN), an empathetic doctor who experienced a similar loss years ago, Maggie finally grieves for the loss of her son. Then she and Aaron must reunite to face a turbulent and terrifying pregnancy.